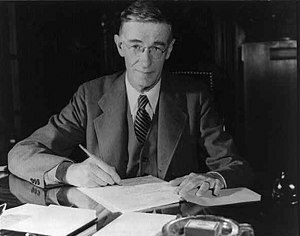 Vannevar Bush (/væˈniːvɑːr/ van-NEE-var; March 11, 1890 – June 28, 1974) was an American engineer, inventor and science administrator. He is known in engineering for his work on analog computers, for founding Raytheon, and for the memex. Bush died of pneumonia in Belmont, Massachusetts, aged 84. ↑ "Vannevar Bush". Computer Science Tree. Retrieved 8 November 2015.